Until the early 1900s, the primary mode of daily transportation in the United States had four legs and ran on hay. Horse-drawn carriages and buggies cost as little as $25 to $50 and could be driven by almost anyone – even children. Then, by the early 1910s, the number of automobiles on the road surpassed the number of horse-drawn "vehicles." The Automobile Club of America noted that in 1909 there were 200,000 motorized cars in the United States. Seven years later, in 1916, there were 2.25 million. This rapid change outpaced the creation of safety measures and laws to regulate the new traffic. 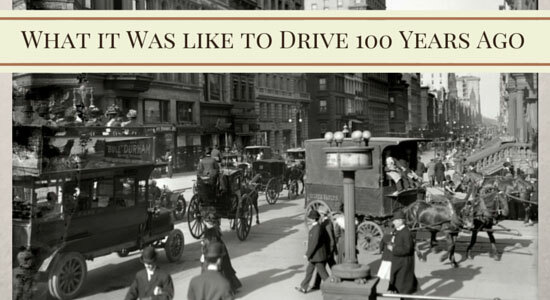 In the first 10 years of the 1900s, there were no stop signs, traffic lights, lane lines, brake lights, driver's licenses, posted speed limits, and more – the list goes on and on. Stop signs – The first stop sign was used in Michigan in 1915. It was black with white lettering and slightly smaller than today's design. In 1922, stop signs were standardized, and their octagonal shape was selected so that drivers facing the back of the sign could easily identify that oncoming drivers were supposed to stop. Speed limits – The main culprit behind accidents in the early part of the 20th century was speeding. For the first time, people could go quickly (as they did in trains) while controlling their own vehicle (as on a horse and buggy). In 1901, Connecticut became the first state to pass a law regulating cars, setting their speed limit at 12 mph in cities and 15 mph on rural roads. However, as late as 1930, a dozen states still didn't have an established speed limit. Driver's licenses – Though some states required drivers to have licenses in the first years of the 20th century, licenses were primarily a form of identification, not a safety measure. For example, Missouri required licenses in 1901, but didn't make people pass a driving test until 1952. Pennsylvania was the first state to put an age restriction on driver's licenses – a minimum age of 18 years. Before then, it was possible to see children as young as 11 or 12 behind the wheel of the family car or making deliveries in a truck. Traffic lights – The first electric traffic light was installed in Cleveland, Ohio in 1914. It consisted of four pairs of green and red lights that were wired to a manually operated switch inside a control booth. 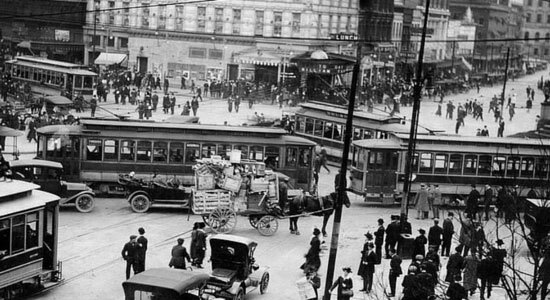 Prior to this, cars, buggies, bicyclists, streetcars, and pedestrians had to jockey for the right-of-way. Without the foundation of traffic safety in place, you can imagine just how chaotic, stressful, and dangerous the early years of driving were. Motorists parked wherever they saw fit, which often meant in front of fire hydrants or in intersections. Because the basics of driving weren't taught, drivers frequently engaged in careless behaviors, such as not turning left through an intersection into the far, perpendicular lane. Instead, "corner cutters" made quick left turns much like we make right turns today, hitting pedestrians and other cars. Finally, in the mid-1920s, the nation started addressing the problem of traffic safety under the U.S. Secretary of Commerce, Herbert Hoover. Car manufacturers began to adopt safety features such as turn signals, brake lights, and standard headlights. Over the coming decades, states started requiring driver's exams and education, and laws concerning dangerous behaviors like speeding and drunk driving took shape. 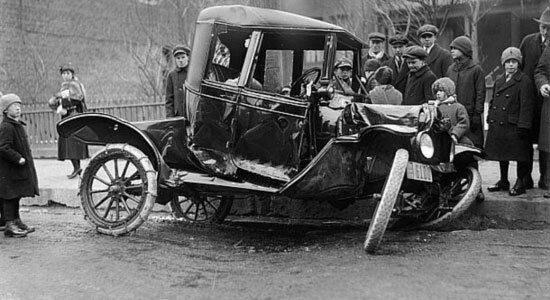 Even though driving today is a much more regulated affair than it was 100 years ago, it is still dangerous. Just because laws are in place doesn't mean people will follow them, and serious accidents happen all too often. If you've been injured in a car accident, we can help. Our phones answer 24/7. “1900-1930: The Years of Driving Dangerously.” The Detroit News. April 26, 2015. “A Brief History of the American Driver’s License.” January 17, 2014. “First electric traffic signal installed.” History.com. July 10, 2015. “Horse and buggy.” Wikipedia. March 24, 2015. “5th Avenue & 42nd Street 1910.” Jas254, imgur.com.